Quick post again! 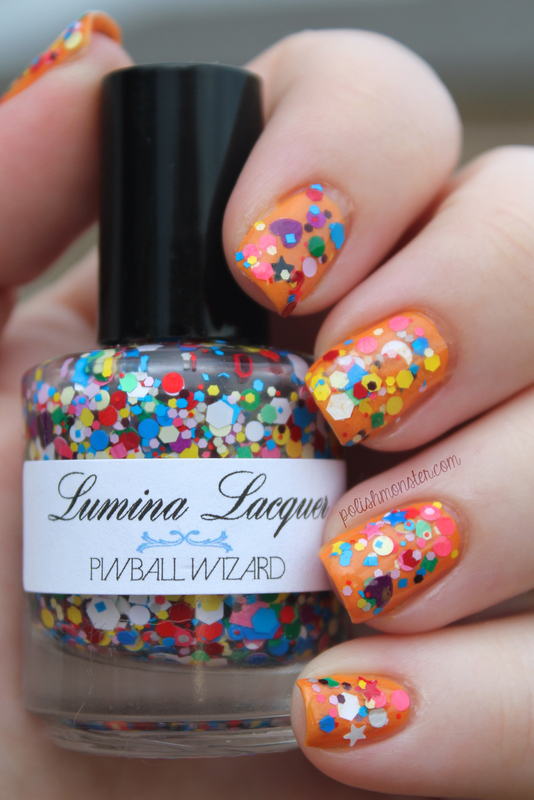 Today I paired up two of my untried polishes- Zoya Arizona and Lumina Lacquer Pinball Wizard! 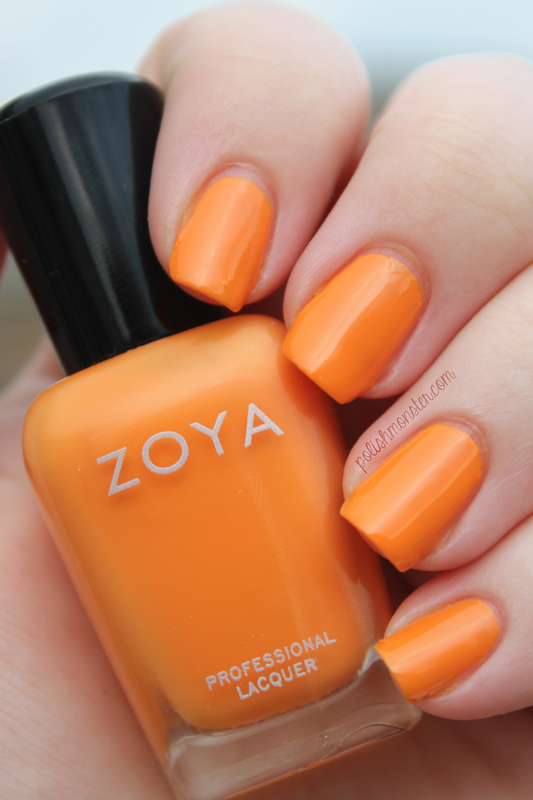 Zoya Arizona is a bright orange cream polish with a glossy finish. This was part of last year’s summer collection, Beach and Surf (in the Beach portion). I *adore* the Beach and Surf collections- I think I own a majority of them now with a few exceptions. Arizona went on well- this is 2 coats with no topcoat (look at that shine without topcoat!). I did have a few slightly bald areas after 2 coats, but I was rushing my paint job a little bit. I noticed that the dry time even with no topcoat was pretty fast too- it was relatively touch-dry after taking photos. 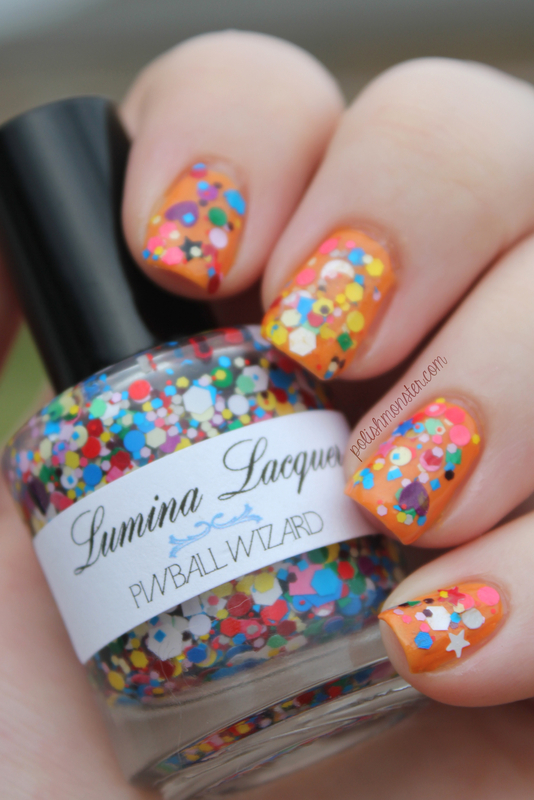 Next I added Lumina Lacquer’s Pinball Wizard on top. This is a glitter polish in a clear base that is chock FULL of matte glitters in every shape, size and color you can imagine. I used 1 coat on top of Arizona with topcoat. As I tend to do with most glitter bombs, I used the dabbing method to place a lot of the glitters. I didn’t have to do any fishing for these large shapes and sizes- they came right up with no effort along with all the other glitters! You can buy Zoya nail polish at ULTA stores as well as their website for $8 a bottle, and you can find Lumina Lacquer at their website for $10 a bottle. 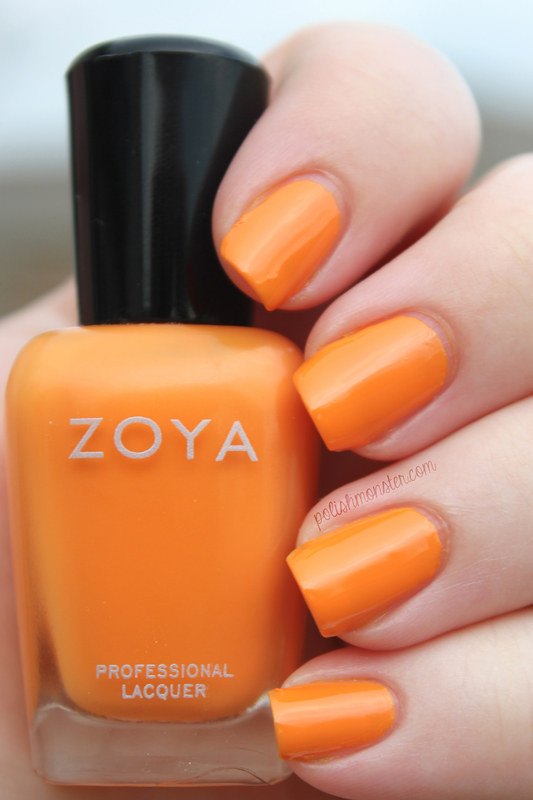 You can follow Zoya and Lumina Lacquer on Facebook for more news and updates!